The consequences of Earth’s exploration of the Galaxy come home to roost when the Drasin track a human ship back to Earth. Mounting a desperate defense, the crew of the NAC spacecraft Odyssey, their allies, and the people of Earth face an overwhelming force of invading alien ships wielding terrible power. Doomed from the start, but with nowhere to retreat, Captain Eric Weston commits his ship to the defense of the human race even as the human outposts in Sol system fall one by one before the unrelenting Drasin onslaught. 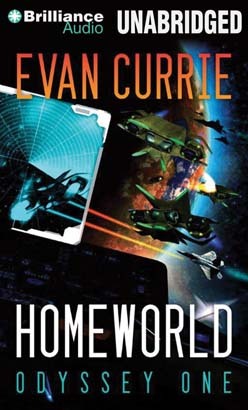 A first-rate military science fiction epic that combines old-school space opera and modern storytelling, Homeworld: Odyssey One, the third installment of the Odyssey One series, brings the riveting, exhilarating, hard-pressed action to Earth, with devastating consequences.